California’s Healthy Workplaces, Healthy Families Act of 2014 (AB 1522) is one of the more comprehensive paid sick leave laws in the US. It mandates that three days of sick leave are available to full-time employees. And some California cities, such as San Francisco and Los Angeles, add even more. As of January 31, 2018, AB 1522 has been expanded to impact nearly all California employers. Knowing how California’s sick leave laws work is only the first step in staying compliant. You also need an easy and accurate way to keep track of employee time off. Homebase is a scheduling platform designed for small businesses. It features easy scheduling and time tracking features as well as integrations with popular POS and accounting software. Homebase also tracks both paid and unpaid breaks to keep you compliant with labor laws. Best of all, Homebase is free if you have only one location, no matter how many employees you have. Paid sick leave is time that employees can take away from their job to attend to their own or their family’s medical needs, paid at their regular pay rate. This can include illnesses, doctors appointments or, in California, time away due to domestic violence issues. While not required by federal law, three days of paid sick leave is required in California. In addition, many cities in California have stricter requirements, such as San Francisco, that requires 72 hours of paid sick leave be provided to full-time employees. Federal law doesn’t require sick leave to be paid, but there are laws like the Fair Labor Standards Act (FLSA) that affect how leave should be calculated if it is paid. Human resources best practices indicate that exempt employees shouldn’t be required to take sick time in less than full-day increments (to avoid undermining their “exempt” status). The table below summarizes how different California’s sick leave rules are from the federal government. Further below we provide another table showing examples of California cities that take these requirements even further. While the federal government doesn’t require paid sick leave and, therefore, provides few details on how to set up a sick leave policy, the California Labor Commissioner’s Office provides a free 45-minute webinar to explain the sick time laws in California. They also provide free workplace posters in English and Spanish to explain the policy to your employees and answer frequently asked questions. California Assembly Bill 304 increases sick leave requirements over and above what’s required by FMLA. In addition, there are local ordinances in major urban areas, such as San Francisco, Los Angeles, San Diego, and the surrounding communities. Depending on where your business is located, you’ll need to abide by the stricter of these regulations in order to remain compliant when offering leave, including sick leave. The Family Medical Leave Act (FMLA) is a federal law that provides unpaid leave to employees who work in companies that employ more than 50 people in one location. This typically allows employees who have worked at least 1,250 hours per year to take time off for their own or for a family member’s medical needs. California laws providing for paid sick leave can help offset an employee’s lost wages when using FMLA. The California Family Rights Act (CFRA) adds to the FMLA guideline and even provides a tool to help you calculate how much leave an employee may be eligible for. Other federal labor laws, such as anti-discrimination laws like the Americans with Disability Act and the Pregnancy Discrimination Act, may also impact how you assess or grant sick leave in California. Sick leave is calculated differently for part-time hourly vs. salaried employees as well as for employees paid based on commission or piece work. Regardless, accruals need to start on the employee’s 30th day of employment. Alternatively, employers can provide a lump sum of three days per year for full-time staff as long as it’s granted to new hires before their 120th day of employment. The easiest way to calculate accruals for hourly staff is to provide one hour of sick leave for every 30 hours that the employee has worked. That includes both regular and overtime hours. It also makes it fair for part-time staff who may work fewer hours but will still accrue sick leave at the same 1:30 ratio. Pat (part-time employee) worked 45 hours in the bimonthly pay period. She accrued 1.5 hours of sick leave. For employees who are salaried, you can estimate accruals based on a 40-hour work week by giving each salaried employee 1.33 hours of accrued sick time for every week worked. That ensures that, during the course of the year, they’ll reach the 24 hours per year of paid sick leave (three days per year) as required in California. Kerry (salaried employee) is paid every other week. He earns 2.66 hours of sick leave each pay period. For workers paid by piece or commission, it’s best to pay out three days per year. To determine the pay rate for sick leave when a California worker is paid by the piece, you’ll need to determine how many pieces the employee was paid for (and at what rate) during the prior 90 days, and then use the average daily rate to pay sick leave. Cory assembled 450 units during the past 90 days, earning $25 per unit and averaging 7.5 units per day. His three days of sick leave should be paid at $187.50 per day. Calculating sick time rates for commission-based employees is very similar to calculating piece work. Again, it’s best to provide commission-based employees with three days or 24 hours per year as a flat rate to keep the math simple. To get an hourly rate to pay for sick leave, divide the total commissions received for 90 days by the number of work hours in that same time frame. Alex earned $12,000 in commissions during the past 90 days while salaried employees worked 520 work hours. Therefore, Alex’s sick leave should be paid at $23 per hour. The best way to comply with California sick leave laws is to follow the State of California guidelines. 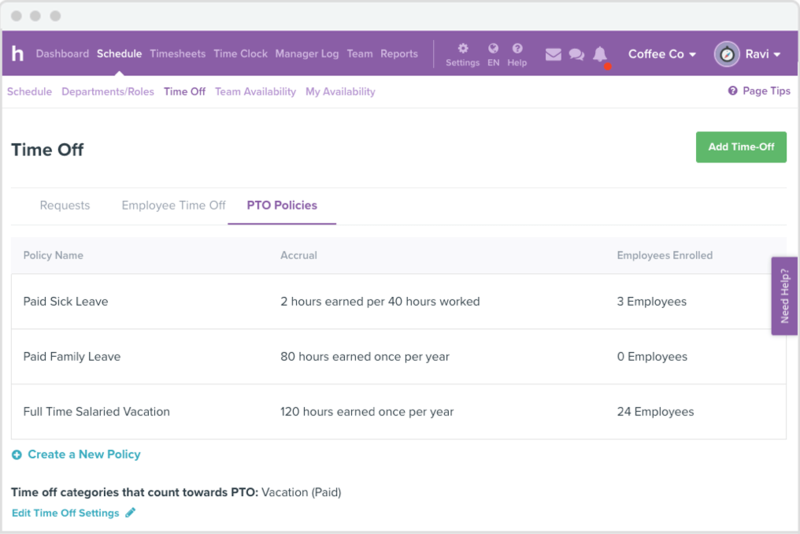 You can then use scheduling software like Homebase to set and keep track of your PTO policies and manage all your time off requests, both paid and unpaid, all in one place. Click here to get started for free. As an employer in California, you’ll have some options such as whether to provide sick leave as a lump sum, what time limits to place on your sick leave requests and whether to keep your sick leave policy separate from PTO. California provides two options for employers to process sick leave — a year-end lump sum payment or a rollover of up to three days (one year’s unused sick leave). However, as a business, it’s your choice. You can pay out any unused sick leave balance at the end of each year in lieu of rolling it over if you provide a lump sum amount of 24 hours (three days) at the start of the next year. Here are the differences between the two options. Using a payroll provide like Gusto to manage employee leave balances and sick time accruals can be a huge time saver. California law states that you can’t require employees to use paid sick leave in increments of less than two hours. However, as a best practice, the two-hour limit should be used only for hourly employees who are non-exempt. Consider a longer minimum, such as a half-day or full-day, for salaried exempt staff. In fact, if you have salaried or exempt employees, you may want to recommend that sick leave be used only in full-day increments as tracking time off for exempt employees on an hourly basis, might open your business up to a claim of misclassification of exempt vs. non-exempt status. Here are additional FAQs from a California government website. It’s a best practice in California to track your employees’ sick leave separate from paid time off (PTO) that’s used for vacation. Some companies do this by setting up two leave policies. One for PTO, which is for vacation or any other purpose like an employee taking a “mental-health-day” or time off for a child’s school visit. In California, unused PTO must be paid out upon an employee termination. Sick leave is not required to be paid out upon termination. In addition, providing PTO is optional while providing paid sick leave is required. If you combine the policies and allow employees to use PTO as sick time, you may find yourself obligated to pay it all out upon termination, even though sick time wouldn’t have been required to be paid out otherwise. Multiple cities in California have even stricter requirements for providing paid sick leave than California does as a state. Places like San Francisco triple the requirements, mandating employers pay up to 72 hours of sick leave a year, and requiring employers to allow employees to accrue sick leave starting on day one instead of day 30. Two examples are shown in the table below. Many of the communities near San Francisco and Los Angeles have their own sick leave requirements. As a California business owner, look at your city or county wage and hour website to find out what the mandatory paid sick leave requirements are. Like many labor laws in California, there are risks of not complying with California sick leave laws. In fact, if your business is located in a city with stricter regulations, you have to comply with both — local (city) sick leave mandates in the location where your employees live or work as well as the state of California laws. Below are other risks. The most common issue that uniformed California businesses might encounter is not realizing they have to offer paid sick leave or they will be subject to fines and penalties. However, they must not only pay sick leave but document an employee’s earned and used sick leave balances. This is most often done by providing the accrued, used and available sick leave on each employee’s pay stub. Sick leave data can also be made available to employees online. Other sick leave mistakes are a bit less common but certainly can be costly. Whether firing an employee for taking sick leave (prohibited), failing to keep good records (risky) or penalizing employees who don’t provide documentation (not allowed), here are examples of risks to avoid regarding managing your sick leave policy. Years ago, it was common for employers to require an employee to provide a doctor’s note in order to take sick leave. However, in California, this documentation is not required. In addition, the worker does not have to provide advance notice. California employers are prohibited from requiring the workers themselves to find a replacement to cover their shift. Be careful to exclude any requirements like this from your sick leave policy. In California, they violate the law. If a manager punishes an employee in any way (or worse, fires them) for using available paid sick leave, the company could be fined up to $10,000. In addition, the employer could also be ordered to pay back pay for any lost wages had the employee been suspended, demoted or terminated. California doesn’t allow you to discipline an employee for taking time off for paid sick leave, such as a doctor’s appointment or illness. However, you are able to discipline your employees if they fail to notify you per your documented attendance policy (no show/no call) or if they’ve used all their available paid sick leave benefit and fail to report to work (unless they’re eligible or applied for FMLA, in which case your company leave policy takes precedence). One of the benefits of running a business in California is the beautiful climate and scenery. However, California has some of the strictest employment and labor laws in the country. Therefore, we recommend you consider outsourcing HR and legal compliance tasks to ensure you abide by California regulations and avoid unnecessary labor law audits and fines. We find the best way to remain compliant with complex labor laws like those in the state of California, and cities like San Francisco and Los Angeles, is to use scheduling software like Homebase to set and keep track of your PTO policies and manage all your time off requests. I read your post regarding California’s sick leave law. Your post indicates that “Employer can require employees to use sick leave in no less than two-hour increments.” The statute actually reads, “An employee may determine how much paid sick leave he or she needs to use, provided that an employer may set a reasonable minimum increment, not to exceed two hours, for the use of paid sick leave.” Your post indicates the opposite of what the law provides. Thanks for clarifying. Our articles are written from the employer point of view as our website serves small business owners. Both statements are intended to be saying the same thing. Yes, an employee can determine how much time off and the increments they can take it in — that minimum reasonable increment is two hours. For example, an employer can’t say “you need an hour off for a doctors appointment, so you have to take 1/2 day”. That wouldn’t be fair to the employee. But on the flip side, if the employee says, I need to take an hour off early to talk to my child’s psychologist, the employer can process that as unpaid time — they don’t have to pay sick leave for that because it’s under two hours. How would a licensed attorney have worded that differently to make it clear to the employers that they can set a minimum — but that minimum can’t be more than two hours? FREE Paid Time Off (PTO) Template!